The beautiful weather of spring and summer is often marred by the presence of pestering stable flies, ticks and other biting insects. We douse our horses in fly spray to try to make rides and time in turnout more enjoyable, but bugs are relentless. A new, exciting fly spray is available now from Ecovet™, which has us here at Dover smiling happily as our horses’ tails hang quietly and still while they graze in their paddocks. We were able to chat with veterinarian Tim John about this new fly spray he created and what makes it different and effective. We’ve found Ecovet to be highly effective. Tell us about some of the ingredients you use to achieve a successful fly spray. What makes it work so well? Bugs use scents to find things. Some odors attract bugs and some repel them. The food-grade fatty acids that we use mimic some of the repellent smells that animals naturally have on their skin. We are essentially using the bug’s own navigation against itself by overwhelming that system. Horse owners are always concerned about the ingredients of products being put on their horses. Can we spray confidently with Ecovet? Ecovet has passed numerous EPA tests and most recently met requirements of the state of California. How comfortable can you feel using it? The fatty acids are naturally derived. One of the main ingredients is a volatile silicone oil. It carries the fatty acids in the spray, but once it is exposed to air, it evaporates in about 30 minutes. What spurred the idea for creating a new fly spray? How long has it taken you to find the perfect formula? Unfortunately, I can’t really take the credit on this account. I was searching for an alternative to pyrethroid and essential oil sprays, as I saw my daughter and wife, who are passionate about horses, inadvertently dousing themselves as they treated their horses. I discovered some original research conducted by a company about 15 years ago as they were trying to develop a chemical free, effective alternative to DEET for the military. They did a lot of testing of the formulation. One thing led to another and the rest, as they say, is history. What types of insects and pests will Ecovet repel? It repels and kills mosquitoes, flies, ticks, no-see-ums (which cause difficult-to-treat allergies) and cockroaches. Ecovet is long-lasting — you typically only need to apply it every two to three days. Recent testing has confirmed a very low toxicity to honeybees. Tell us a bit about your background. Do you specialize in horses? How long have you been a practicing veterinarian? I have been a veterinarian for 25 years. I was fortunate to join the largest private practice in the state of Washington right after I graduated. We are a multi-species practice that includes five board-certified equine surgeons and one internal medicine specialist. Currently, I practice small animal medicine, but I live on our farmette with five horses and a variety of other animals. If someone is hesitant to try Ecovet, what would you say to convince him or her? The old, more toxic technology of the 70’s and 80’s is due for a healthier update. Ecovet is a totally new way of helping your horse. 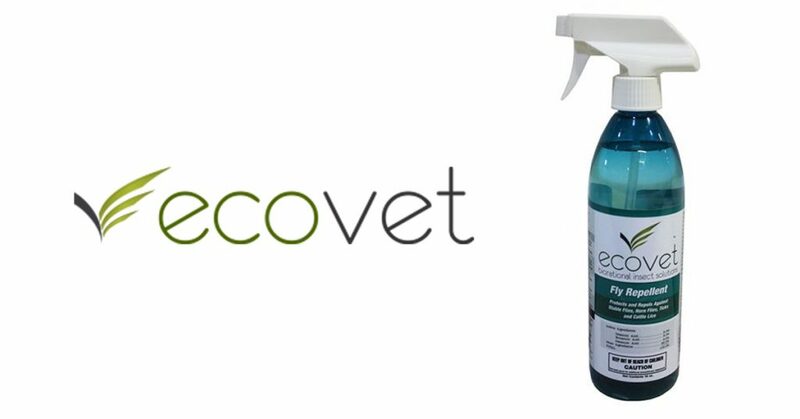 There is no product that is perfect, and we know that Ecovet has a really different scent. We also know that “new” can sometimes be kind of scary, but as the editors at Horse Journal said: “If the flies are laughing at you, you probably want to pull out a bigger gun.” Ecovet is that gun. This entry was posted in Equestrian Community by Dover Saddlery. Bookmark the permalink. Any way to get a sample? My horse is allergic to pyre-therein and I make my own with essential oils. Is better than nothing,but I just cannot believe there is a non toxic solution that lasts for days! Unfortunately we don’t have samples, but it does work quite well. It comes in an 18oz bottle, which you can find here: http://goo.gl/1eFhdE Give it a try and let us know what you think! or other horse related stores?